Happy 4th of July everybody! Or as the rest of the world calls it, Monday! Battlepug received some nice coverage from comics news website, Newsarama last week.You can see that story here. I’d like to thank all the new people checking out the comic and hope you like what’s coming down the road! 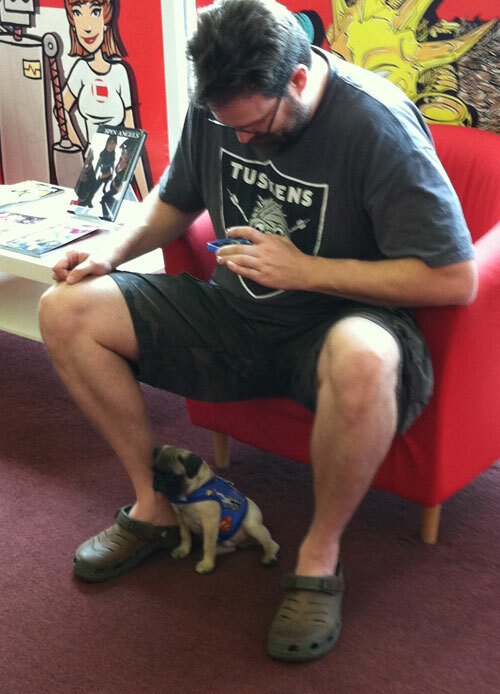 Also got to meet Dexter, one of last week’s reader-submitted Battle Pugs at Challengers Comics here in Chicago. Boy is he a cute little guy. I discovered that he actually IS related to my pug Ninja. Half-brothers!